Our Member of the Month for March is someone whose name should be familiar to anyone who spends time reading questions and answers in the SAP Community – or who frequents the Coffee Corner. I’d like to offer congratulations to Raghu Govindarajan for all his contributions. While Raghu has written blog posts (including one as early as late January), it’s his contributions to questions and answers that are most impressive. 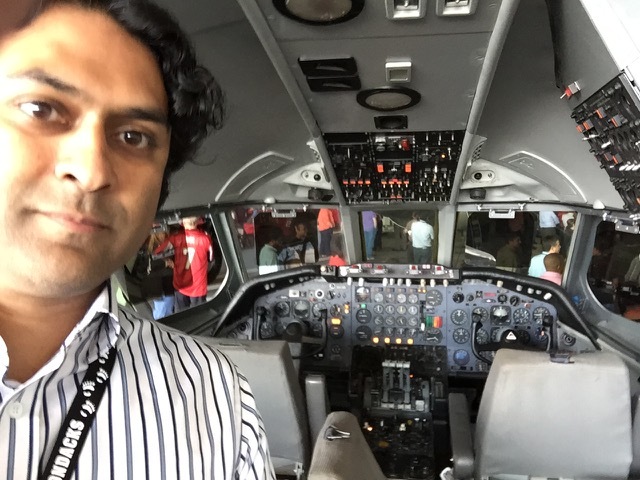 Since the new SAP Community launched in October, Raghu has answered more than 200 questions! And since we’re on the subject of the new SAP Community…Raghu has also made his voice heard in Coffee Corner, where he shares his opinions about the new site. His hard work and honesty in the community make him an obvious choice for Member of the Month. And speaking of hard work…Raghu’s hectic schedule made it impossible to record a video interview this month. But I did get a chance to chat with him off-camera. So let’s get to know him better. Congratulations, Raghu! Would you mind telling me a little about your career? Where do you work and what do you do? I am an independent consultant and have been working on my own for the last 14 years. Wow, that is a long time to work alone! In reality, I do get to meet a lot more people this way than working for a single company. While I have had a couple of clients for close to 2 years at a time, most of my work is shorter and I have been lucky to have worked all over the place for a lot of wonderful companies. While most of my work has been in the Eastern half of the United States, I have made it on assignment to England, Germany, Italy, Denmark, and Holland. With my increased functional focus — meaning longer projects and more on-site interaction — I haven’t traveled as much recently, but I do enjoy seeing Americana up close in the smaller towns and rural areas where a lot of manufacturing and distribution centers are located. You list “SAP Warehouse Management, Logistics Execution, RF, RFID, Barcoding and ABAP” as your areas of expertise in your community profile. Could you explain how you got involved with those areas? Do you focus on anything in particular now? Do you have a preference? It was by accident. Computers were primarily a hobby for me through high school and college. I took a year to try a job in software just to see what it was like — and it just sucked me in. I joined a now defunct company that had a couple bolt-on SAP Warehousing and Barcoding products. Our tiny team went on to build a precursor product to SAP Console a couple of years before SAP did. That was my start working directly with SAP and ABAP. Eventually, to get the RF and barcoding products working successfully, I realized I needed to get both the operations side and the software side working in harmony. With this background, I am one of the few people in the industry who can set up a complete SAP warehousing solution — from business process optimization, SAP functional, ABAP, setting up the Console Server or ITS Services, RF hardware selection and setup, barcode design and networking. I even had a forklift operator’s license at one point though I am a little rusty with all of the 45 pallets I’ve moved a decade ago! I think that is why I remain an independent: Different clients hire me thinking I am a specialist in only one role — functional, technical, hardware, et cetera. I do confuse a lot of people with my apparent lack of focus; I just look at it as trying to get the warehouse working optimally with SAP. Raghu really knows his way around a warehouse. 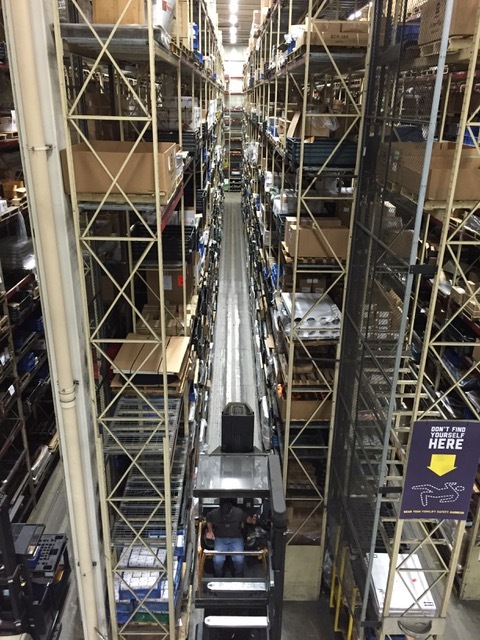 This was his view from about 40 feet up in the Crown Equipment warehouse on their TSP series pickers. I’m still looking at your profile — and I’m sorry to go off on a tangent, but that’s just how my mind works — you have an Former Member. (I think that may violate the community’s rules of engagement. But don’t worry…I won’t tell anybody.) What is that an image of? And why did you choose it? The word “Avatar” in Hinduism means a manifestation of a deity in an earthly form, human or otherwise. It is — or rather was, until its reappropriation in the computer and video game worlds — colloquially used to refer to holy men and teachers. I just thought it would be a pun to combine all these meanings in one image. Wow, that’s…a more interesting answer than I would have expected. Thanks for providing those personal insights. While we’re on personal topics…what do you do outside of work? Any hobbies or interests that excite you out of the office? For the last few months, I have been obsessing about how to make the house we moved into last year more energy efficient and to do it on a reasonable budget. I am a fan of the passive house movement and also old houses. Those two are usually mutually exclusive — so, that will keep me occupied for a few years. Food and drink is also something that I like and enjoy these days. If you ask my family, they would probably say that cooking is a hobby. To me, it is like a giant science experiment with the benefit of yumminess at the end. I have also been through periods of photography and amateur racing, so ask me again in another couple of years and it will likely be something else. I’m surprised you have time for anything, with all of the questions you answer in the community. As I said earlier — you’ve responded to hundreds of questions, sometimes several a day. So walk me through your typical day please. Have you made checking community questions a part of your daily routine? I used to be a news junkie with a couple of news aggregation pages open at all times. I just think that part of routine has gotten a little depressing — I guess I didn’t even realize the coincidence of the timing of me getting active in the community until you asked. Now I have the SAP Community page open in a tab at most times. Being able to do something other than just straight work for 10 or 15 minutes periodically is just a diversion from working on the same problem most of the day. It helps me break up my work and then re-focus. And I hopefully manage to help someone while at it. I see from your profile that you joined the community in 2012, but I only really noticed your activity since your launch of the new platform. Then again, I only joined the community shortly before the move from SCN. Anyway, were you always this active in answering questions? Or is there something that recently inspired you to participate more? I have always found a lot of good information from the community. Whenever I Google an issue, I pretty much get an answer that leads me down the right path. Sometimes it is things that I am truly trying to learn about and sometimes it is just something I haven’t done in a year or two and need a quick refresher on. I did sign up to start actively following Rolf-Martin Woersinger for Java SAP Gui updates because I am on an Apple Mac. Then more recently Horst Keller for all things new in ABAP and also Thomas Fiedler when I started using ADT a couple of years ago. I guess this is when I started realizing how active the community really was. OK, I brought up the new platform, so here goes…you, like many active community members, have been pretty forthcoming with your opinions about the SAP Community transition. So short of switching back to SCN, is there anything in particular you really want to see change? I can better tell you what turned me off before I started participating on a regular basis. It took me seeing there were several awesome individuals who contributed positively before I jumped in headfirst. One of my early turnoffs was people who have completely nonsensical answers, which have nothing to do with the question asked. It is sort of like they look for a keyword and then write everything they know about that keyword. It reminds me of all the recruiters who see RF on my résumé and call me about jobs putting up cell-phone masts for Verizon. The up/down voting is helping this situation, but I am worried that it is ripe for personal vendettas — Karma points or not. I wonder if putting in another layer of why a comment was up- or down-voted would help. I am also long-time reader of Slashdot where the votes are tied to a category like being insightful or informative or funny. I know that the team behind the community is really trying hard to make the Activities stream usable. There are a few reasons people are asking for an RSS feed. The one that gets stated most often is the obvious fact that the RSS feed readers are vastly superior to anything you will be doing in the near future with the Activities page. The biggest thing that I haven’t seen so far is that most people have other interests than just the SAP Community. My daily reading already involves a news aggregator which has about ten main sources and my feed reader which covers another ten blogs/news sites for science, gadgets, and racing. Why am I being forced to go to a single site to get information from a part of it, and in a pretty poor manner? If you still have an internal version of the old SCN website around internally, you should try turning the RSS feed on and using Feedly to read the RSS feed. And also try the J and K keyboard shortcuts — it’s like magic! Raghu’s consulting work has taken him to several different countries, so he is no stranger to planes. Here he is at the Delta Airlines Museum during their IT picnic. In addition to answering questions and providing feedback about the new platform, as I said earlier, you also write blogs — with the most recent one coming in January. Can we expect you to write more blogs in future? If so, what can we expect you to write about? I am sure I will. One topic that I want to write about is my own personal version of an MVC framework. The process of blogging is also getting my writing habits back in focus. I have one half-written book on setting up a custom Radio-Frequency barcoding using SAP ITS Mobile that I need to start working on again. I haven’t been writing for the last couple of years. I blame it on kid number two. Really, I just have to get in the habit of writing again! Although you’ve been incredibly visible throughout the community, I believe every new person approaches a community with a sense of apprehension. By that I mean that people might feel too intimidated to answer questions or otherwise participate, especially after first joining. As someone who has been so heavily involved, you are clearly comfortable with community interaction. So, what I’m asking is: Do you have any suggestions for members who may not be participating yet? Start following a couple of topics that you are interested in. The thing that really got me to join the community in earnest was that before the transition, I added a few topics that I was interested in to my feed reader — when it was still an option. Now, I guess you would just follow the activity page. When there is a topic that you know about or thing you can positively contribute to, or even ask an additional question to, just do it. No one here bites! Thanks for taking the time to talk to me, Raghu — and thanks for making the community a better place. I look forward to continuing to see you share your expertise and opinions (even the harsh ones!) in SAP Community. I’ll just add to what Jerry said, it has been a pleasure to follow your comments in the Coffee Corner, and I’ve come to recognize your “avatar” avatar (and now I know more about the history of that word than I did before!) as a signal that here is a comment worth reading. And, hmm, what a coincidence on the timing of your increased activity in the community — I hadn’t thought about that particular synergy before. Congratulations on MoM! I look forward to more contributions from you. Good choice and great interview, Jerry. Wonderful interview Jerry. It was truly a fascinating read. It was so interesting to get to know a little bit about you. Your zest for learning (with your myriad of hobbies 🙂 ) comes across clearly and your support of community is very much appreciated. Thank you all, it is definitely an honor to just share this space with all of you – leave alone the recognition. Good Interview / Good Posts / Good to keep going..